Reliance Jio users who were complaining about low download speeds might have a reason to rejoice. 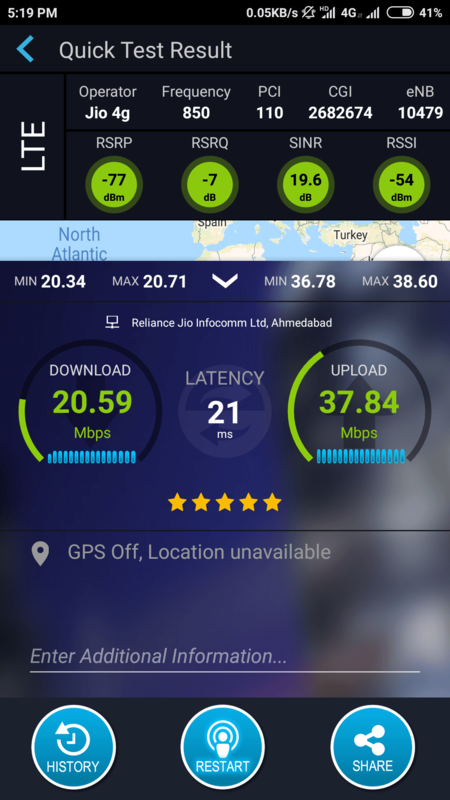 After witnessing a consecutive decline in download speeds for two months, in March and April, finally, new speed test results highlight that Reliance Jio has managed to register an improvement in download speeds. The data was shared by Telecom Regulatory Authority of India (Trai’s) MySpeed portal. The tests revealed that Reliance Jio’s download speeds were pegged at 22.3 Mbps for June month, up from the previous number of 19 Mbps in May. 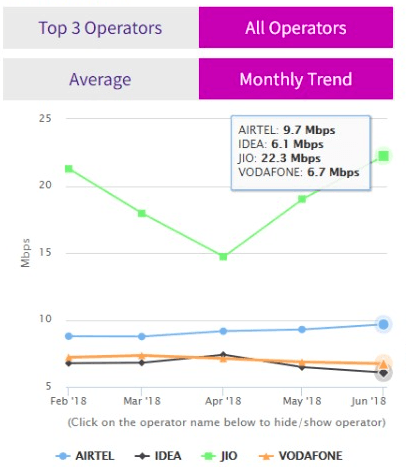 Airtel stood second with 9.7 Mbps (9.3 Mbps in May) speed, and Vodafone ranked third with downloading speeds averaging 6.7 Mbps (6.8 Mbps in May). Idea Cellular stayed behind all by registering the speed of 6.1 Mbps. (6.5 Mbps in May). Trai also revealed that over Over 3 million speed tests have conducted on Jio. Over 750,000 tests have been done on Airtel’s network, and 300,000 more have been conducted for testing Vodafone India’s net speed. Contrary to the download speed rankings, Idea Cellular stood first in upload speed by registering 5.9 Mbps. However, compared to May the upload speeds for Idea Cellular have come down significantly. On the second number was Vodafone which averaged 5.3 Mbps, Jio stood third with 5.1 Mbps and last was Airtel which could only average 3.8 Mbps of upload speed in June. Trai’s MySpeed app testing methodology has been questioned over the last six months and even the regulator seems to be working closely with other network speed testing firms such as Ookla. If you would like to test the upload and download speeds of your carrier yourself, you can head over to Fast.com – a speed testing service by Netflix which will also allow you to measure upload speeds and more technical parameters like latency after its latest revamp. Thats Airtel for you 🙂 love it or hate it, it still is going to rule. You must be in small cell coverage area, where upload bandwidth must be open and unused. For cellular towers this upload speed is very rare for a network in band 5 with only a 5 MHz chunk of spectrum. 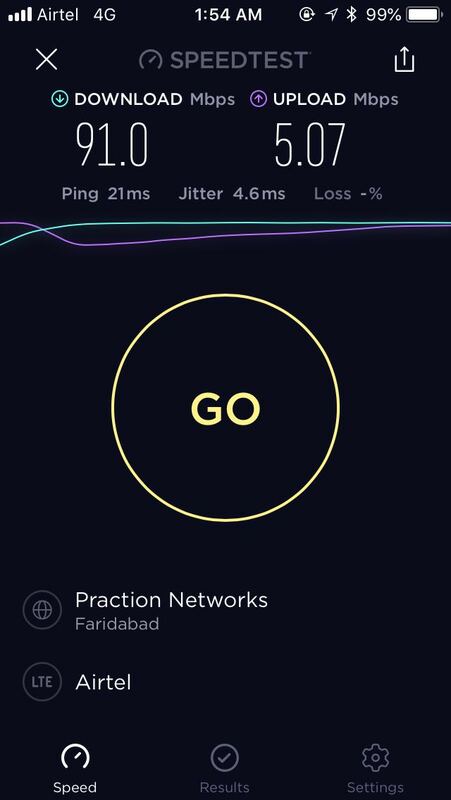 No Adil, connected with 70 mtr nearest tower which has wireless backhaul, I am always getting good speed on band 5 than band 40, band 3 is dead at my home, I never seen such speed on band5 anywhere. Looks like band 5 is really really empty at your location otherwise such high speeds on 5 Mhz is unbelievable. Looks like the users are all concentrated near the site and latch to band 40 & 3 more. Are you locking band 5?! On 850MHz band, Jio isn’t able to cap the upload speed as there’s a dedicated 10MHz bandwidth for upload and 10MHz for download. So since there are some users on the network, your download speed is less. Gujarat circle has 5 MHz on band 5. This had to be a small cell or a repeater connected to fibre broadband for in building coverage. It’s extremely rare for band 5 in cities to have download and upload speeds like these. Jio is struggling to provide capacity on towers with wireless backhaul except towers in the jungle area where load is less. For towers in urban areas and alongside arterial road and railway lines they are struggling big time to provide consistent quality of service. After September-october there will be big boost in coverage and speeds as there will be 10Mhz bandwidth. Using 10 Mhz on band 5 here, nothing special. Download speeds are always bad during day time and evening peak hours. By March-April next year you might see capacity increase in Jio exponentially. Band 5 works on FDD LTE, so there are two frequencies allocated for downlink and uplink. Obviously downloading happens more than uploading on average so that’s why upload speeds are generally higher on band 5. Here in peak hours band 5 download speeds crawl at 1-2 Mbps while upload speeds are generally unaffected and hover around 15-20 Mbps.